As a kid, I would run from tomatoes. We grew them in copious amounts in our garden and at the time I had no appreciation of their goodness and freshness. Most were used for tomato sauce that my mom canned and would serve throughout the year as a topping for my favorite dish growing up, spaghetti. As my age has grown, so has my love for this ancient fruit that is believed to have first been domesticated as early as 500 BC. Although fresh grown are always a better bet for providing the most flavor, as a resident of the mid-west my only choice for making a sauce in early April was from a can on the shelf or the bin at my local produce department. I opted for the later and created a rich and aromatic sauce to help bridge the gap between a cold and rainy spring to the hope of warm summer days ahead. I’ve been making my own sauce for a couple of years now and to be honest, most of the time I did not bother seeding them. 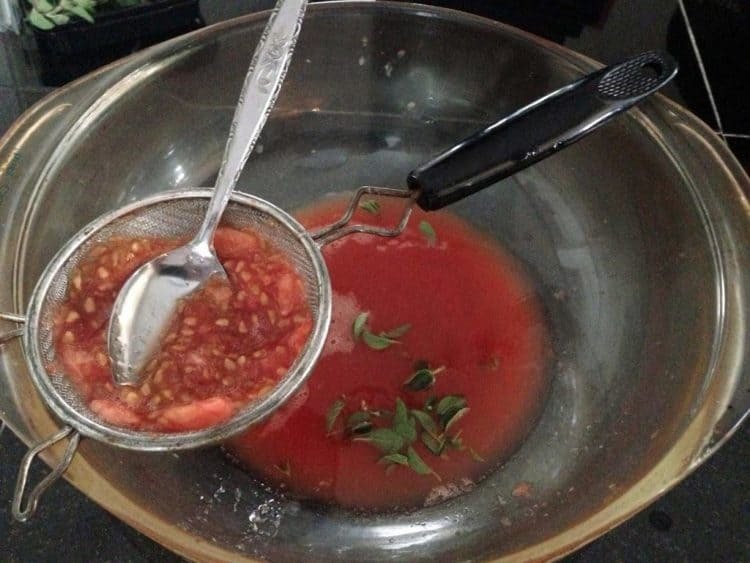 Aficionados will tell you that tomato seeds add a bitter flavor to a sauce. Although my palate is not sensitive enough to appreciate the difference, aesthetically, seeds from a tomato have nothing to add, regardless of flavor. The primary factor that kept me from seeding tomatoes in the past is that I was never proficient at the task and I ended up wasting most of the pulp and much of the meat of the fruit. This past weekend I had an “Ah-ha!” moment, and suddenly the process was as simple as it sounds. Cutting the tomato longitudinally with a serrated knife, the seeds are readily scooped out with a tablespoon. To conserve the juice, I drained the pulp and seeds in a small strainer. I was amazed at the amount of tomato juice was saved. I placed some fresh oregano in the collection bowl so it could be infused with the juice while the rest of the sauce was being prepared. 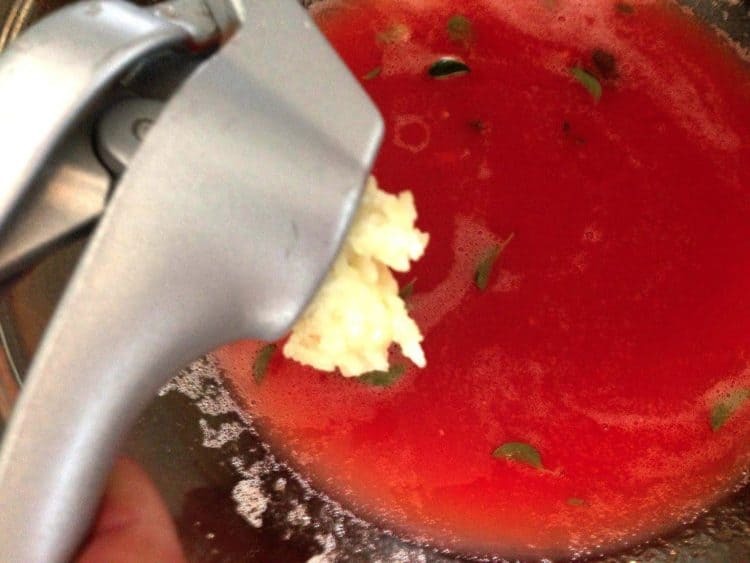 Garlic gets along very well with this combination of tomato juicer and oregano. I allowed the three cronies to mingle while the big guys were roasting. 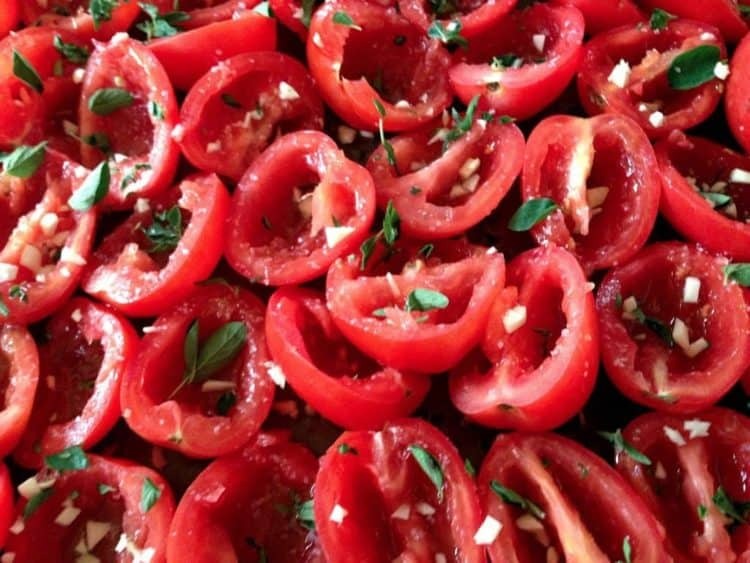 The garlic, oregano, olive oil and tomatoes filled the air of with an otherworldly aroma while roasting. A wonderful way to add warmth to our small cottage, on a small lake, in the middle of Nowhere, Wisconsin on a cold and rainy April weekend. 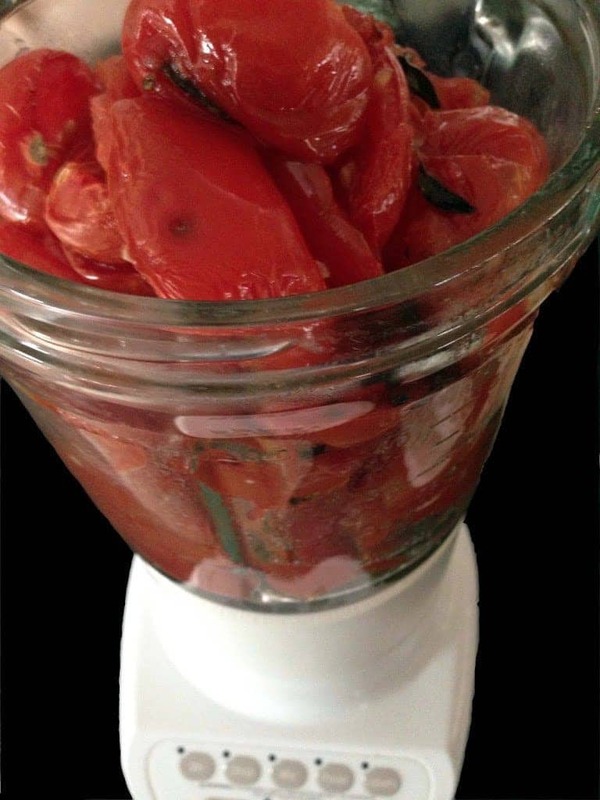 After roasting, the tomatoes are placed in a blender and pureed for 1 to 2 minutes. I was surprised by the change in color from red to orange, after the tomatoes were purred. This color reverted back to red over time while the sauce cooked, leading me to believe the lighter color was the result of air being added to the tomatoes during the puree process. I was reminded that it’s not the end of the world if you don’t have a means to puree the tomatoes. Given a long and slow bath in a hot slow cooker, the skins will break down significantly although perhaps not completely, in the absence of pureeing. The supporting cast of this sauce was prepped in a similar fashion. Sweet baby bell peppers, a cubed onion, and finely chopped portabella mushrooms were all roasted with a coating of olive oil. The peppers were then diced and this mixture was added to my slow cooker to coalesce with the tomato sauce. This is a versatile sauce, it can be used with lasagna, with spaghetti, with any member of the parmigiana family (eggplant, chicken, veal, etc) or served over meatballs. 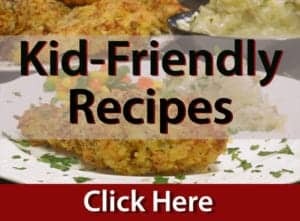 These are just a examples, part of the fun of creating your own recipes lies in the license to do with them as you wish. For whatever use you decide to use this sauce, it loves to be sprinkled with some fresh Parmesan or mozzarella and paired with a nice pour of red wine to your liking. 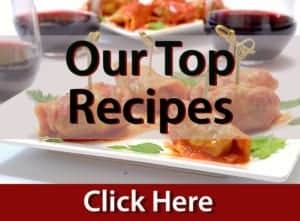 Be Sure and Follow Us on Facebook and Never Miss a Great Recipe or Great Cooking Idea! InstructionsPreheat oven to 350 degrees. Set slow cooker to high and coat the surface with olive oil. Place beef or pork bone in slow cooker and cover. 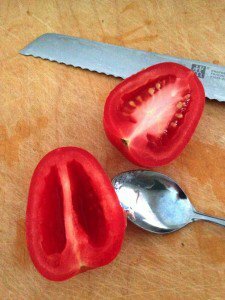 Wash tomatoes, then slice lenthwise with a serrated knife. Seed tomatoes, saving pulp and seeds in small bowl to be strained later. 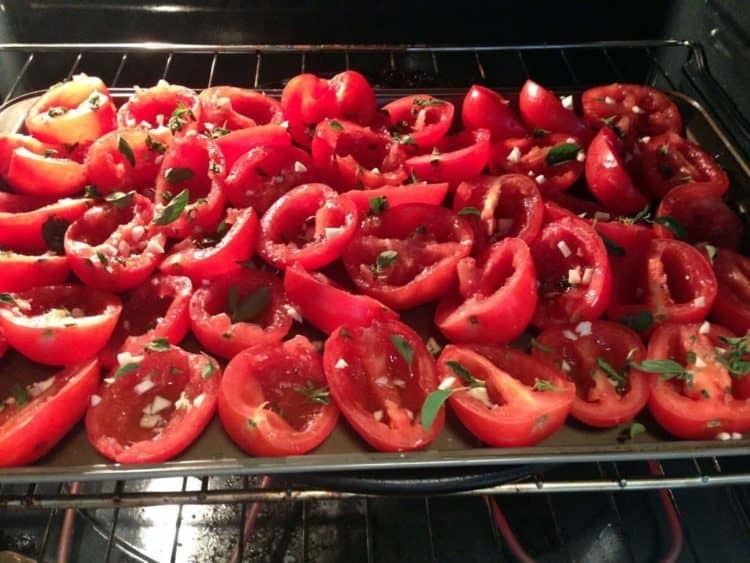 Place tomatoes on cookie sheet, coated with olive oil. Dice one to two cloves of garlic and 2 table spoons of fresh oregano and sprinkle over tomatoes. Sprinkle kosher salt and fresh crushed peppercorn over tomatoes. Place in oven on center rack and allow to roast for 25 to 30 minutes. While the tomatoes are roasting, strain pulp and seeds and add 1 tablespoon fresh oregano and 2 cloves crushed garlic to resulting juice and add to slow cooker. 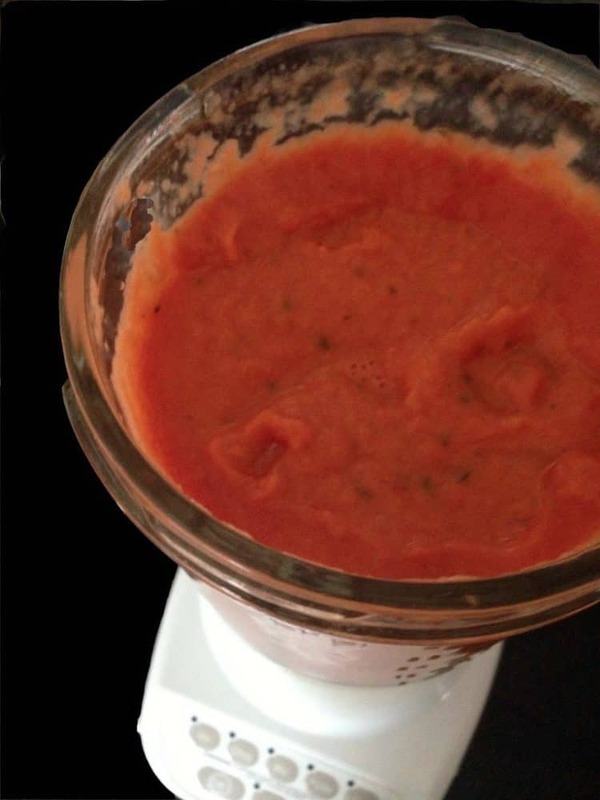 Remove from oven and place tomatoes in blender and puree for 1 to 2 minutes. 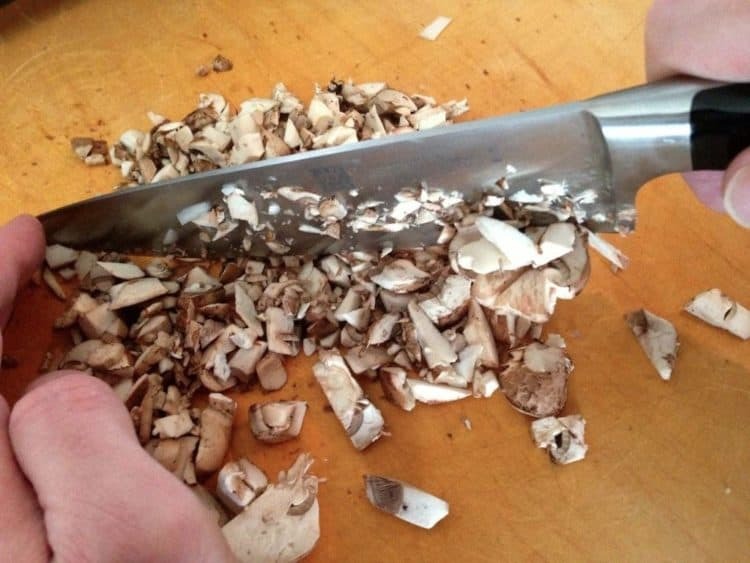 Place this mixture in the slow cooker and reduce heat to warm. Wash, cut, and seed peppers in similar fashion as tomatoes. Place on cookie sheet coated with olive oil, skin side up. Sprinkle onion and mushrooms on peppers, drizzle olive oil over top of vegetables, and roast at 350 degrees for 20 minutes. 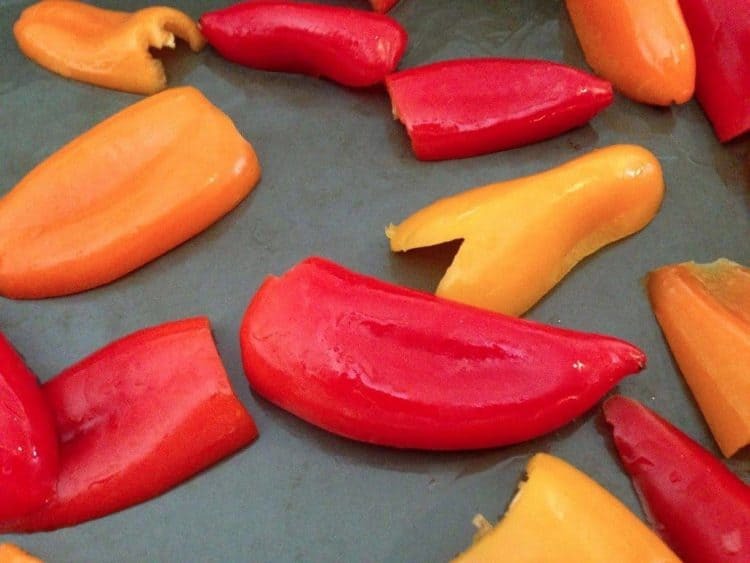 Remove from oven, dice peppers, and add mixture to slow cooker. 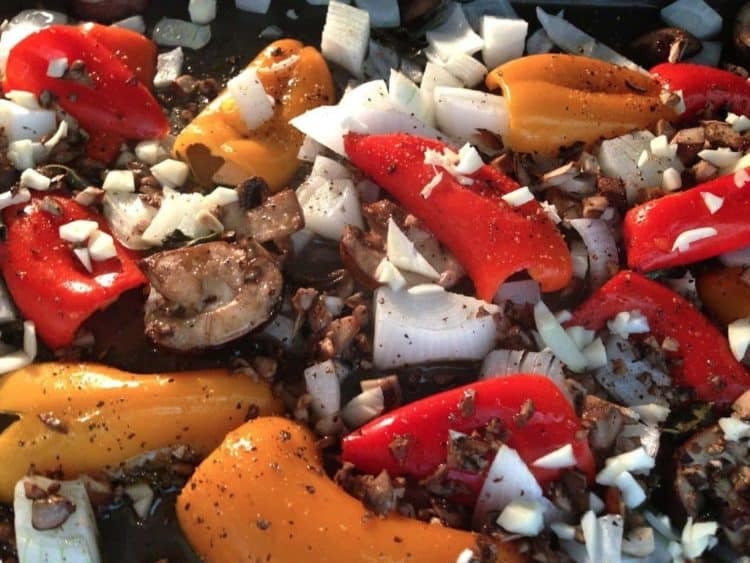 Add anchovies, wine, and pepper to slow cooker. Stir thoroughly ensuring all ingredients are mixed well. If necessary, add tomato paste for thickening. 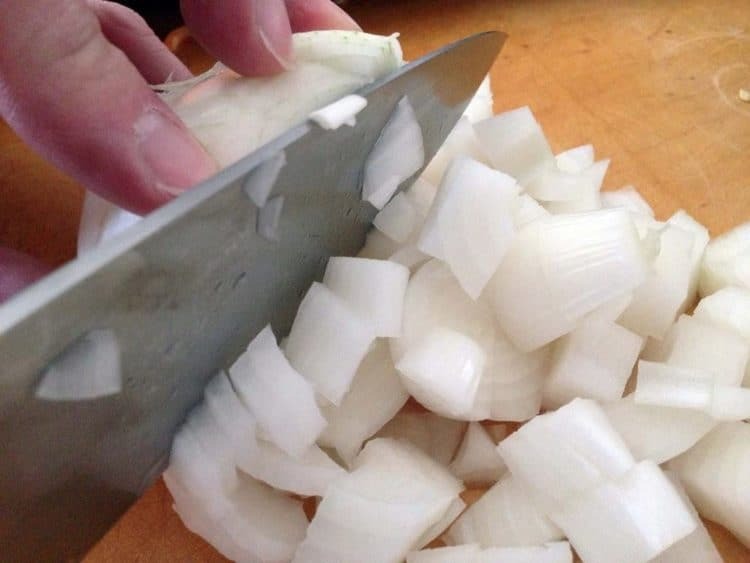 Allow to cook 2 to several hours. Add a couple of fresh basil leaves during the slow-cooking process, whole or chopped. These will only make the taste even better. Throw a cup full of shredded carrots into the sauce. Roast these with the other vegetable friends to help exude their full, sweet flavor. Tomato paste is available in tubes (like toothpaste.) This packaging allows you to use the amount you need and safely save the remaining paste for another time, as opposed of wasting the leftover paste you may have from a can. Consider anchovy paste for the same reason. Maybe you don’t want to use a whole tin. The tube option allows you to flavor to taste. Play with your herbs and seasoning. You’ll be surprised at what a great tasting sauce you are capable of putting together, without using a jar full of sugar and preservatives. 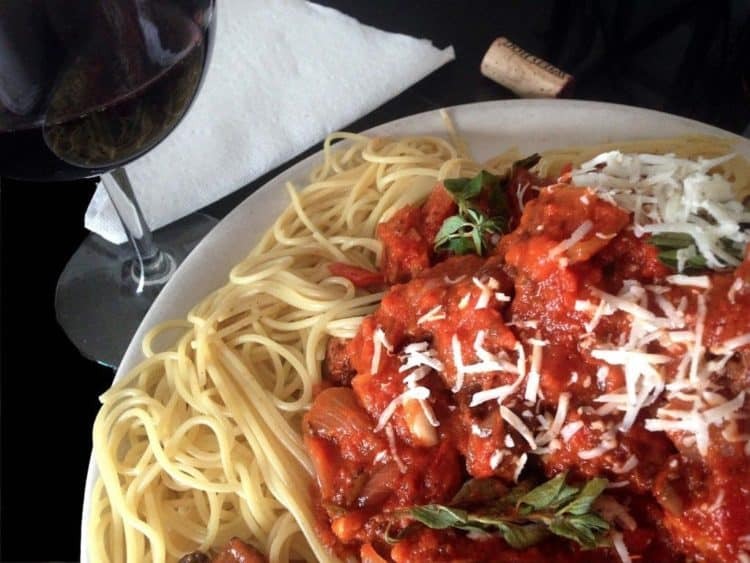 There’s nothing like a good glass of wine with a savory tomato sauce. If you’re looking for ideas, consider a valpolicella. You can typically find a good bottle of this for $12 or less. One of my favorite brands is Zenato but there are other winemakers who produce this basic red Italian table wine from the Venoto region of north-eastern Italy.. If you like the valpolicella and want to step it up a notch, try a ripasso one of my favorites and just another variety of valpolicella. A good bottle of ripasso will set you back $20 or more. If you really like the ripasso, then treat yourself to some amorene, yet another variation of the same wine but at a higher end and much higher price point, over $50. Look for a future Platter Talk piece on all of these and more. It’s easy to write about the things I love dearly in life, and it’s all good when I say Italien reds are prominent on that list! This looks great, I usually take the skins off my tomatoes, do you find that this makes a difference in flavor at all? cause I’d love to not have to seed tomatoes!! Thanks so much, Nicole. I have done both and to be honest, the roasting process imparts such an enhanced flavor on the sauce, I have found little to no discernible difference in taste by leaving the skins on. It is obviously less labor intensive to leave them on and sometimes we all take shortcuts in the kitchen. 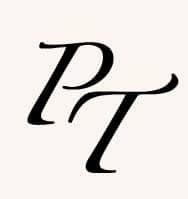 Thank again for stopping by Platter Talk. Thank, Kat. This will be even better once our juicy reds are ready to come out of the garden, in a few short months! Love the idea of roasting the tomatoes first and then making the sauce. Looks delicious! Thanks for stopping by Platter Talk. Besides excentuating the flavors, roasting makes th entire house smell really, really good! BTW, your site is fantastic. Looking forward to following you, thanks again for commenting. This looks terrific! Love the idea of roasting everything first!